Our principals have industry experience dating to 1990. We believe that there is no room for error or shoddy work in this business. You see, there is CQA and then there is quality CQA. Any time you hire a third-party firm to do your field work, you are assuming risk. Will they get the job done correctly and efficiently? Do they have the know-how? The CQA we performs is independent of an “in-house” engineer. This provides another layer of security for an owner or regulator. But, can I trust them? Wouldn’t it be nice to hand off the job and consider it done? With CQA Solutions, you can. We’re certified and highly experienced. We stay on top of what’s going on in the industry, we embrace new technologies when they come along and we offer the most rigorous training we can find. The last thing you need is confusing data, time consuming phone calls, and extra site visits to clean up a mess made by unqualified techs. Up goes your budget and up goes your stress level. Good grief! It’s the details that make the difference. We won’t settle for anything less than a job done right. After all, it’s not just our reputation on the line — it’s also yours. We get that. And we won’t let you down. You can read details on how we serve your industry in the section below. Are you pouring your profit right back into the ground? The typical heap leaching mining project loses hundreds of thousands of dollars in profits. How? By precious minerals leaking back into the soil after being extracted. It’s a sad fact that leakage has become an accepted part of the industry — just a cost of doing business. The good news is that it doesn’t have to be this way! It is possible to construct containment systems that don’t leak. As in ZERO LEAKS. How do we know? We’ve been on construction teams that have made it happen! We view your project as you do, as an Income Producing Asset. And, we want to help you maximize your ROI. It begins with understanding what you might already be losing. The table above shows potential loss for Gold concentrate, based on leakage considered to be at acceptable standard levels (ALR). For example, on a containment system that leaks 550 gallons per acre per day, there is a daily mineral loss of 0.10 t oz per acre. * Over a 10-year life span, that equates to a $47.5 million loss on a 100-acre asset! Do you consider these leakage rates acceptable? We certainly do not! What a huge drain on your project’s ROI. In almost all cases the cost of preventing these leaks is a very small fraction of the cost of losing concentrate. The table Copper Concentrate Leakage shows the approximate mineral content that is potentially lost, on an acre-per-day basis, at the ALR rates for copper. On time. Under budget. Compliant. And, if extracting the ore was not challenging enough, today’s miners have to deal with increasingly difficult environmental and safety regulations while trying to keep public relations in check and still turning a profit. We appreciate our miners; without you, life as we know it today would not be possible. After all if you can’t grow it, you have to mine it! How do I maximize my heap leach ROI? How do I continue to meet stringent ALR regulations? Is Zero leak containment really possible? How do I ensure my surface operations won’t damage any sound containment system and create further delays or fines? How do we find people with the right expertise to get these projects built? While we cannot change the regulations, we can partner with you to ensure that your containment projects are on time, under budget and compliant. Most battles are won and lost in the “War Room” before troops ever hit the field. Containment construction is no different. We’ve been through the battles, and led our partners to huge successes. We bring our knowledge to the forefront of each project during the planning stages, ensuring that containment designs are based on a fundamental understanding of the field operations processes, and that the design is actually constructible in the field. We are experts in zero-leak containment facilities and we are here to help! Whether it is someone to manage installations on multiple sites, or simply oversee the installation on one site, our team is here to assist you! As your construction manager and field team, start to finish, we make sure your job is done right. We are a team of highly-skilled field professionals. Everything we do revolves around ensuring that your containment system will perform with outstanding quality throughout its intended life span. On-Time, Under Budget, Zero Leaks! We understand the importance of training for the long- term benefits to your projects. We also understand that you don’t have time to send people away for training. Our Mobile Solutions are the perfect solution. CQAS provides training for site owners, engineering, field personnel, and any vendors that could impact the quality of your containment units. By educating parties that interact with the liner system of the importance of containment units and preventing damages, not only should incidental damages decrease, but personnel can be held accountable for damaging the materials. Protect your investment by having CQAS train your staff and vendors! In your industry, time is money. Every minute counts. You have millions of dollars invested in your assets. Your construction and maintenance costs alone are in the tens of thousands – per day. With the regulatory changes that are coming, why go through a learning curve that someone else has already mastered? We’ve been doing Subtitle C and Subtitle D containment for 25 years. We know what causes delays and how to avoid them. We know how to execute quality and do it swiftly. We can anticipates issues before they become your problem. Let us help you get ahead of these impending changes. We have applied decades of construction quality experience and expertise in containment systems across multiple industries including waste, energy, agriculture and mining. Can you afford a 30-day shutdown—especially one that could be easily prevented? While the rule changes may be new to you, we are experienced in navigating clients through the strict requirements of Subtitle D and Subtitle C containment facilities. It all starts with proper design. If your goal is an installation that lasts 30 years, how do you know your specs will deliver that? If your installation needs to meet Subtitle D, how do you know what qualifies as compliant and what does not? We will consult to ensure that the plans and specifications will meet your business goals while also ensuring quality installation and regulatory compliance. We are your eyes and ears on the jobsite. We ensure that you’ll have a sound installation that meets regulatory standards, is functionally operational and is constructed for the desired life of the asset. We understand that time is money and you can’t afford to waste either. You need it done right the first time. You can’t afford to slow down. But, you also can’t afford an involuntary shutdown due to poor construction. When we’re on your jobsite, you won’t find the wrong material being allowed on the project, failing welds and other shoddy workmanship. Not only do we address the major items, we’re sticklers about details. Poor beveling, extrusion overgrinds and mismatched welding rod should not be tolerated. Using our CQA services, you’ll know that the construction goes according to the project specs. You’ve invested millions in your project and it is now operational. The last thing you need is a sound liner system that becomes ruined after installation. Does your staff know how to live and work on the geomembrane without damaging it? Did you know that the chemical used to clean a drilling rig will destroy a liner system within hours of contact? Do the vendors who empty your frac tanks know where they are allowed and now allowed to drive their vehicles? You’ve just completed the construction of a pad and someone drives an ATV across the liner or drives a survey stake through the geomembrane, an instant and fineable breach of containment. We’ve seen it happen! It’s imperative that your staff understand how to protect your investment! We will provide training for everyone onsite, from construction staff to your employees to vendors. How Are You Handling Subtitle D? How do we meet the new compliance standards within what seems to be an unachievable timeframe? How do we develop the right strategy for becoming compliant? How do we write a proposal to the regulatory agencies that will result in the issuance of a permit? What materials do we need and will they be available within the timeframe I need them? While Subtitle D may be new to your industry, it’s certainly not new to us. We’ve been successfully navigating Subtitle D regulations for 25 years. We understand that what you do is critical to the nation’s power grid and how having reliable power for everyone depends upon your installations being sound and compliant. We can’t change the rules or delay their implementation. But, we can partner with you to help you be successful during a very challenging time. What makes this all the more challenging is that the actual field construction of containment systems is a niche specialty. It’s hard to internally staff personnel who are experts at it, yet you need someone who understands your business priorities and how those issues translate into your construction project and impact your bottom line. We understand that. Let us help you manage it. 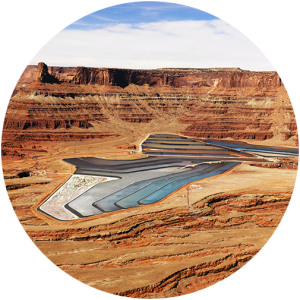 Regulations, time and cost all dictate that your impoundment systems need to be completed on-time and under budget while meeting all regulatory compliance requirements. Most battles are won and lost in the “War Room” before the troops ever hit the field. Containment Construction is no different. Containment designs should be based on a fundamental understanding of field operations and processes. This will ensure a better quality project that can be constructed with a shorter timeline while meeting all regulatory requirements. While designs are often focused on material functionality, we bring a field perspective to that process that is often missing: field constructability! Large scale energy projects require a construction manager. It’s the construction manager who watches over your project to ensure that the time and money you’ve invested in your design isn’t wasted in the field. You need someone who can manage construction operations from a business goals perspective in light of new Subtitle D requirements. Anything can look good on paper, but will it be constructed in a way that satisfies both you and the regulators? As your construction manager and field team, start to finish we make sure your job is done right. We are a team of highly-skilled field professionals. Everything we do revolves around ensuring that your containment system will perform with outstanding quality throughout its intended life span. At the end of the day, you need a team that gives you the best ROI and protects your assets. That’s what we do. We provide the best possible return on investment for your containment asset because we understand how important it is to your bottom line. CQAS provides training for site owners, engineering, field personnel and regulatory agencies. Whether providing quality training, IAGI or GRI proctoring; we are always happy to bring the training right to you with our Mobile Solutions program. The right knowledge makes all the difference in success. SuperTek is a real-time software solution we developed for Geosynthetic installations that uses a system of validations and punch lists to ensure construction conforms to project specifications. CQA and installer technicians enter field data into hand-held digital tablets. The SuperTek software streamlines CQA activities by practically walking the technician through both the data collection and review process while ensuring the construction data meets the specifications in real-time. Let us provide the training and technology for your project and get peace of mind! 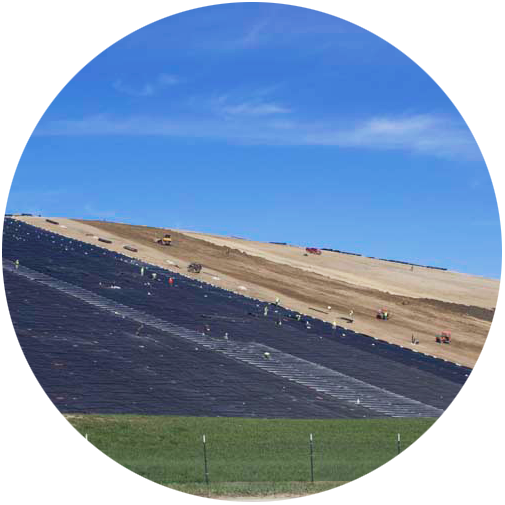 Although geosynthetics can be installed without third-party CQA, the quality of the final product is documented to greatly increase when a third party CQA is present. 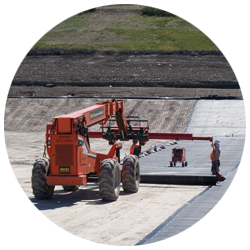 This is particularly important when dealing with the geomembrane liners, which are typically installed as an impermeable barrier to keep components contained. Simply put, the field technician is the eyes and ears of the certifying engineer and can make or break a project, possibly leading to catastrophic conditions in the future. To perform field testing at an acceptable level, the technician must understand the principals behind the tests, the intent of the design, the material characteristics, and be able to discern when the test numbers are not representative of the actual conditions they are observing in the field. Too many technicians do not function beyond just recording the test data — they fail to make the correlation to what they are actually observing. One example of this is when a technician writes down a passing compaction test, yet fails to observe that the material has changed, or that the lift shows signs of bonding failure. Either of these scenarios jeopardizes the integrity of the clay liner and can lead to substantial problems in the future — problems that are unrecognized by the certifying engineer whose eyes and ears have failed him. The importance of obtaining representative samples of any construction material will result in increased efficiency during the construction process and help keep project costs within the anticipated budgets. Far too often, project delays in construction develop because the materials change was not noted, or were not sampled properly. 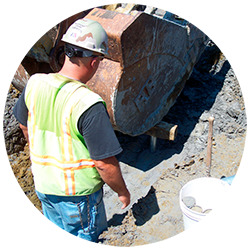 We carefully monitor each sample source and test pit for any variances that could cause problems during construction.